Battery powered devices present unique test challenges. During development, a circuit may be powered from a fixed power supply to eliminate the variability and hassle of debugging with a battery. However, this does not reflect the real environment the circuit will operate in. As a battery discharges its voltage decreases following a battery specific curve until at some point the battery is exhausted and its output voltage collapses. Eventually the device will have to be tested in its real-world environment. Testing a devices behavior as the battery discharges can be time consuming and make reproduction of any failures difficult. A better approach would be to simulate the battery discharge curve over a shorter time period, sufficiently long to allow the device to experience and react to the shifting voltage and short enough that the test can be completed in a reasonable time frame. This allows repeated tests if any failure occurs. To help with these kinds of problems, Five Wire includes the Waveform Source which is capable of acting as a power supply. Its output can drive voltages between 0 – 5 V with load currents up to 100 mA. It can be configured to generate a fixed output such as +3.3V DC but also includes standard waveforms that simulate battery types such as Alkaline, Ni-Cad, Li-ion, Ni-MH, and LiPo. The discharge time can be adjusted to 60 seconds, 300 seconds (5 minutes), or longer. 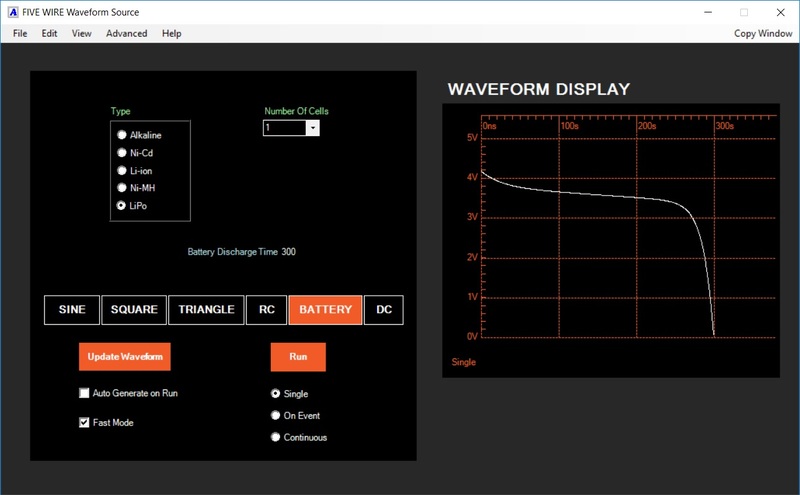 Simulating battery operation of your device using the Five Wire Waveform Source allows you to quickly test and debug issues related to battery operation. 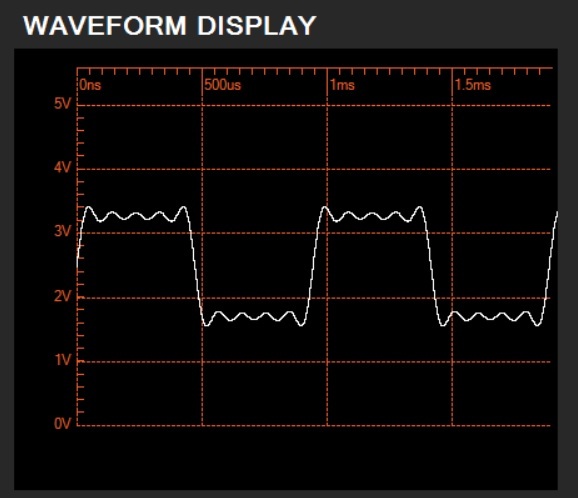 Here is an example of a LiPo discharge over a 5 minute period using the Waveform Source. If the battery type or discharge curve you want to test is not directly supported in the menus, you can create your own custom waveform for testing. The Five Wire Waveform Source is an arbitrary waveform generator (AWG). It has 10 bits of vertical resolution, 0 – 5 V output, and each waveform can include up to 1020 points. The time duration of each point is settable with a range from 10 microseconds to 20 seconds for a maximum waveform duration of 20,400 seconds (more than 5 hours). The waveform can be developed using a spreadsheet or using MBScript, a ‘C’ like scripting language included in the Five Wire application software. The five Wire Waveform Source is an arbitrary waveform generator (AWG). 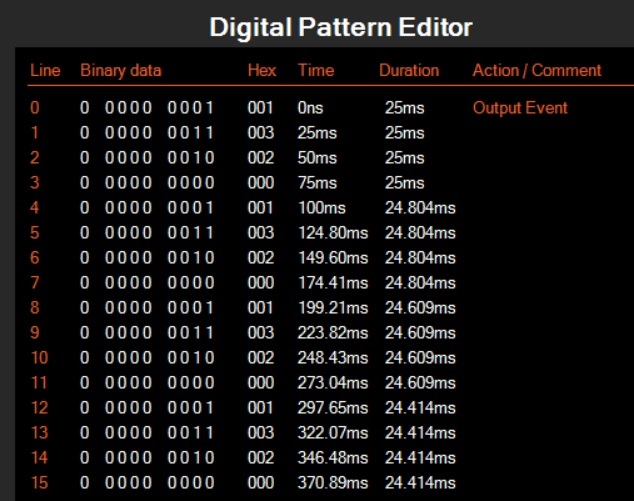 To simplify the user experience the GUI includes standard waveforms such as sine, square, triangle, RC, battery, and DC with settable parameters such as frequency/period, duty cycle, amplitude, etc. 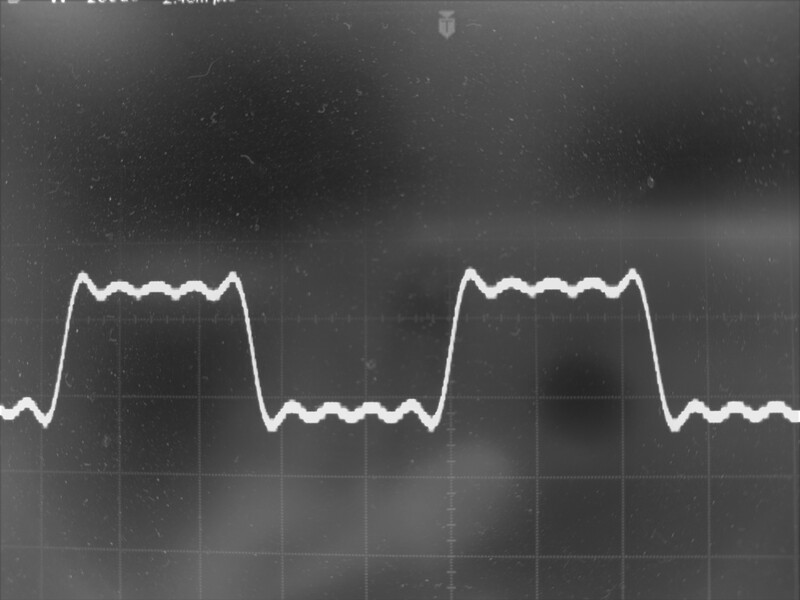 The standard waveforms are easy to use but do not show the full power of the Waveform Source. The Waveform Source generates 0 – 5 V output with 10 bits of resolution. Up to 1020 points can be defined each having a duration from 1 us to hundreds of seconds each. Just like the Logic Source, the Waveform source includes 3 jump controllers providing branch and counted loop control. You can easily generate a custom waveform using the MBScript scripting language. In our first example we will write a script which creates a square wave by combing the fundamental, 3rd, 5th, 7th, and 9th harmonics of a 1KHz sine wave. The script defines a function waveValue() to calculate the signal magnitude at each point. This includes a 2.5 V offset to center the waveform and the fundamental sine wave and its odd harmonics scaled according to the Fourier series. The pattern includes 630 points with factors of 2 x 3 x 3 x 5 x 7 ensuring that complete integral cycles of each harmonic can be created. A for() loop sets the first 659 points by calling the function setPoint(). The last point is created with a jumpA command which is configured to branch back to the beginning of the waveform in an infinite loop. Here is the complete script. Running the script opens the Waveform Source window, loads the waveform, updates the Waveform Display to show its shape in the GUI, and runs the pattern on the Waveform source. Here is a partial screen capture of the Waveform Display view. 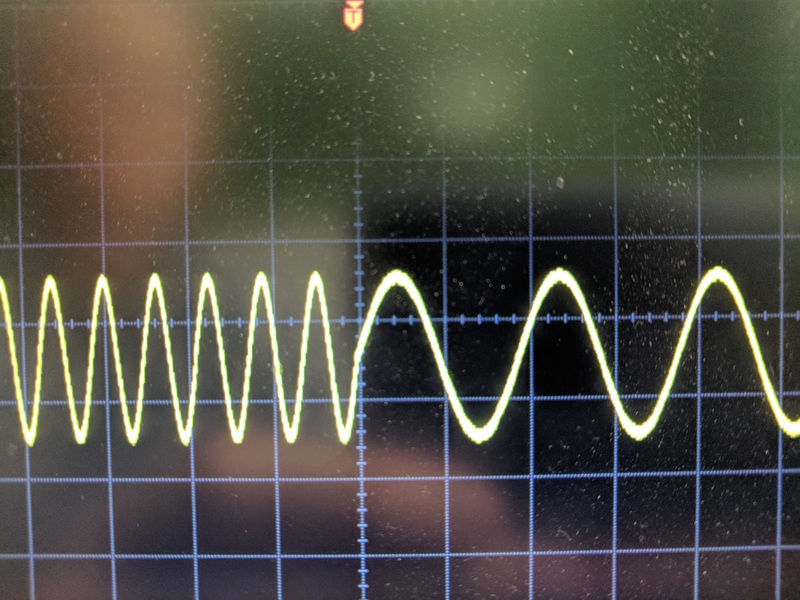 We configure the A and B jump controllers to repeat each frequency for 100 cycles and the C jump controller branches back to the beginning of the waveform forming an infinite loop. Here is a cell phone scope capture of the frequency transition. 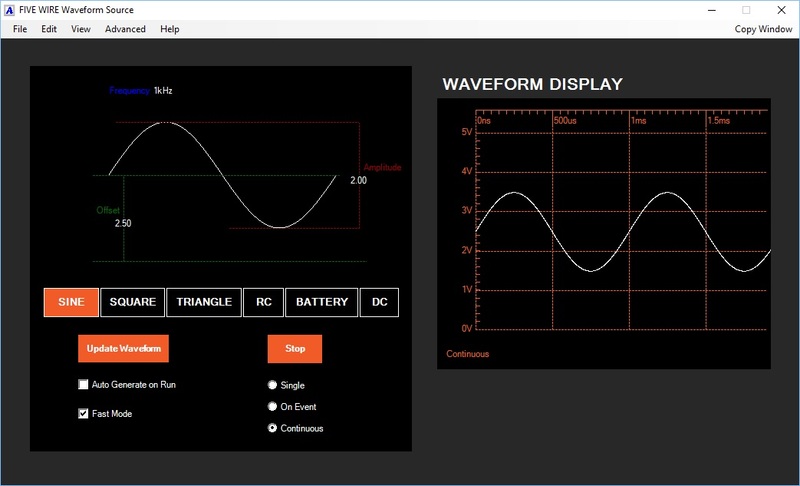 The Waveform Source provides quick easy to use standard waveforms. 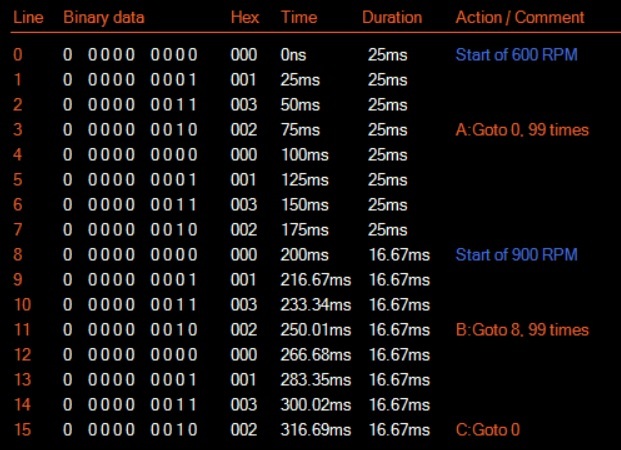 By writing a little MBScript code you can take full advantage of its AWG features.